Lights! Camera! Action! 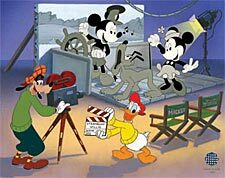 Goofy cranks the camera and Donald directs as the Fab Five recreate a scene from the classic 1928 Walt Disney film ‘Steamboat Willie’ in this terrific 75 Year Commemorative edition. Steamboat Willie was Disney’s first animated film featuring synchronized sound – and it is considered by authors and historians to be one of Disney’s great early moments of achievement. Celebrating Mickey’s 75 Anniversary, both Mickey and Minnie debuted in Steamboat Willie. Although it was actually the third animated short produced by Disney, it was the first released on November 18, 1928. Created by the Walt Disney Studios artists, this edition is a Limited Edition Sericel requiring twenty colors.